Specialist figurines licensed for over 25 years, PLASTOY is today one of the leaders in its market. The company benefits from a unique know-how in the selection of character licenses, design, prototyping, quality control of its plastic and resin figurines, thanks in particular to its creative studio and its sculpture and sculpture workshops. historically located in Normandy. Statues from the Gaston series, these are packed in a window box. 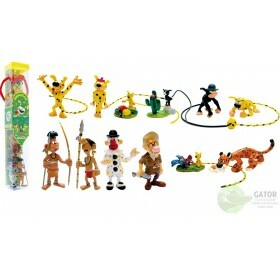 Based on the classic cartoons are these the figures from the series.